Concomitant with the spread of natural plastering in Japan, trowels were developed for various purposes. At the end of the Edo period, with the dissolution of the samurai class, the production of swords was forbidden. Highly skilled sword black smiths, in turn, shifted their emphasis to carpentry and plastering tools. To this day, Japan is known for its exquisite carpentry and plastering tools. 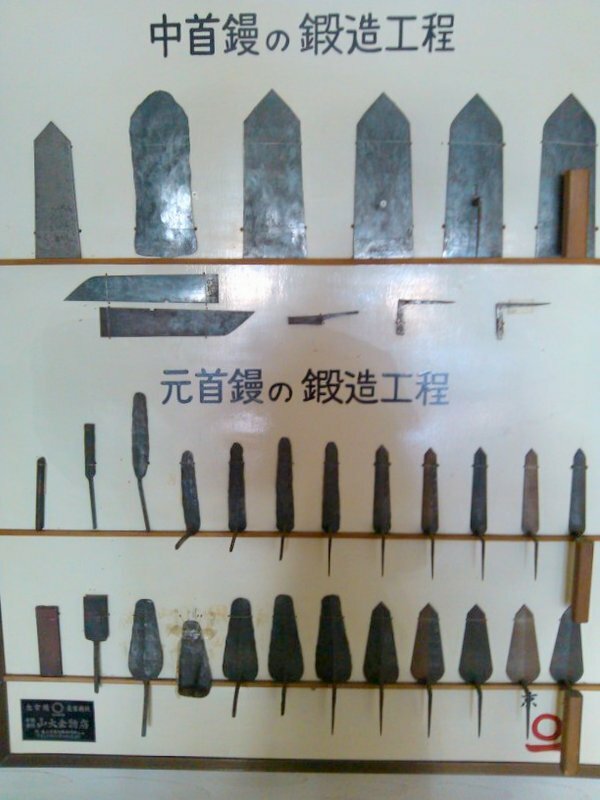 With over 100 different types of trowels, Japan probably hosts the largest variety of trowels on the planet. But unfortunately, with the spread of mass produced commercial building materials and tools, the demand for hand forged trowels has decreased. And as a result, the number of craftsmen who produce these fine tools are dying. There are two general types of trowels: Nakakubi and Motokubi. Nakakubi trowels are typical Japanese trowels, held with the neck attaching the handle and plate between the forefinger and middle finger. Motokubi trowels consist of a single piece of steel, with the neck held between the thumb and forefinger. Motokubi trowels are historically older. Along with the introduction of western cement mortars, Nakabuki trowels were first invented around the end of the 1700's and came into popular use around the end of the 1800's. Originating from the culture of sword making, forging metal in Japan is a fine art. Trowels are produced from steel of various temperaments, ranging from "soft" iron known as jigane to "hard" high carbon steel known as honyaki (literally fully fired). Between these two extremes are a variety of steels including hanyaki (literally half fired) and aburayaki (literally fired with oil). Jigane is unfired forged iron. Whereas a hard carbon steel tends to slide over a plaster, "soft" jigane iron will push and pull material, making it excellent at distributing plaster on wall. By "soft", we refer to the quality of the steel, not the flexibility of the trowel. Because Jigane is a soft steel, Jigane trowels tend to be thick, stiff and heavy. Jigane is suitable for scratch and brown coats of earthen or lime plaster. Hanyaki is fired once after forging. Hanyaki is suitable for all coats, and can also be used for cement mortar as well. Abarayaki is steel that is forged, coated with oil, and then fired twice. It is harder than hanyaki and suitable for compressing plaster for a glossy finish. Honyaki is made in a similar fashion to abarayaki, but is fired at a higher temperature. Being a very hard carbon steel, it is suitable for earthen or lime finish coats and cement mortar. Stainless steel is a relatively hard steel but can be produced so thin as to be flexible as well. It is used to apply thin coats and to smooth trowels marks. Since stainless steel resists corrosion, only stainless steel should be used with gypsum or synthetic plasters. 1. Cut the steel: Steel for both the trowel plate and neck are cut. 2. Forge and shape the steel plate. 3. Open the hole for the neck: The neck connects the plate and handle. 4. Forge and shape the neck and neck hole: The physical pressure applied to trowels differs according to the size of the trowel, the plaster and intended finish. The neck and hole are sized to maintain their shape under the force and pressure of application and compression. 5. Remove the barbs from the steel. 6. Normalize, heat and quench the steel: The steel is heated to 1200℃. 7. Temper the steel: Depending on the desired temperament (Honyaki, Aburayaki, Hanyaki or Jigane), the plate is tempered. 9. Smooth the steel with a grindstone and coarse sandpaper. 10. Swage the neck into the plate: The neck is pounded to form to, and connected with, the plate. 11. Polish the trowel with fine sandpaper. 12. Treat the steel with a protective coating to prevent rusting while in storage: This coating is removed before use or naturally wears off during use. 13. Attach the wood handle. Traditional steels will rust if not cared for properly. Trowels should be cleaned and dried immediately after each use. When storing trowels for an extended period of time, they should be oiled to prevent rusting. In order to prevent the remaining oil from discoloring subsequent plasters, remove oil with a rag before plastering. Yamanishi hand forged trowels are highly regarded in Japan. According to the Kagawa Prefectural Government, Yamanishi hand forged trowels are certified traditional crafts produced by certified traditional artisans. These craftsmen are working incredibly hard to maintain this tradition, and their pride is imbued into every trowel they produce.